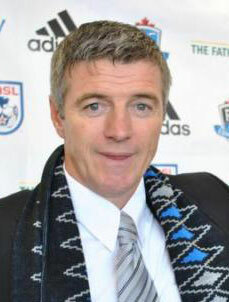 Just hours before the NASL named Bill Peterson as their new commissioner on Tuesday, FC Edmonton announced the man who will be on the bench pulling the strings for the eleven on the field. That man is Canadian Colin Miller. As pointed out here previously, the appointment of Miller, a native Canadian, shows a shift for the Eddies who had previously gone with what owner Tom Fath and front office personnel had thought was superior and more expensive foreign talent. Yet FC Edmonton finished in last place in 2012. Miller’s most recent position was with the University of Fraser Valley Men’s team. Previous to that he was an assistant with the Vancouver Whitecaps from 2009 through the end of the ’11 season. Miller, who was born in Scotland, played in the Scottish League for 15 years and is a former Canadian National Team captain. “Right from the beginning, we wanted to develop Canadian soccer. Today’s move is another step along the way,” said Fath to The 11’s Steven Sandor. “There’s not a massive difference from the bottom of the league to the top of the league,” said Miller. From what he’s seen, the key will be to reduce the amount of “dreadful errors” that led to goals conceded in 2012. FC Edmonton announced some roster moves on October 2nd and and announced the signing of former Minnesota Stars starting midfielder Neil Hlavaty and former Ft Lauderdale Strikers and current Jamaican left-back Lance Laing on November 21. The Eddies have yet to announce to the public the players that have options in their contracts and whom they have exercised those options with and chose to release. The Canadian side was required to submit that information to the NASL front office over a month ago.